It is the staircase to heaven: going up step by step in a narrow fold in the range, you turn around every few minutes, and more and more of Larapinta Valley reveals itself, between craggy orange mountains that glow in the morning light, softened by tall graceful gumtrees, cycads, calitris pines, spinifex and other native grasses. And after what must be 1000 steps, the start of Section 3, mostly hand-placed rocks, you get to the top and the country just takes your breath away: mountains and valleys all around you, the most magnificent vista the West MacDonnells have to offer. And down below, of course is that deep cleft, the sun shining into it for a few minutes at noon, and a lot easier to get to. It’s known as Standley Chasm or Angkerle Atwatye as the Arrernte people call this women’s dreaming site. 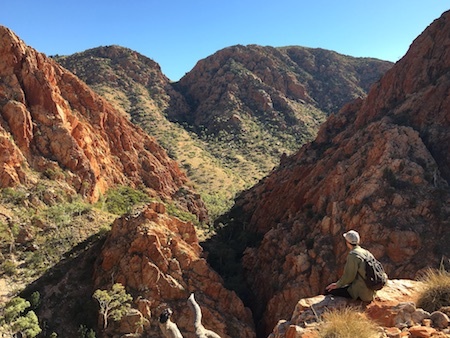 Half as far from Alice Springs as Ross River and a third as far as Glen Helen, Standley Chasm as an attraction is gearing up for a bright future, expanding what it offers to both tourists and locals alike. With the backing of the Traditional Owners, managers Ray and Carol Prunty over the last five years have been steadily improving both facilities and things to do. When they arrived there was already a kiosk for refreshments and a small camping ground. Now they are serving restaurant meals Thursdays to Saturdays, on the deep stone-paved verandah screened from the campground by gumtrees. After sundown on chilly evenings they light a fire to add to the ambience. Caroline and Ray are all the way from Ireland, and their ongoing, ambitious improvements are nowhere near their end. A playground for small children is being developed, and local musicians perform for free on Sunday afternoons. The Boomerangs Restaurant does not have a liquor licence, a result of the Alcohol restriction across all Aboriginal lands in Australia, says Ray. “The Angkerle Atwatye operators, respresenting some 300 members of the local Aboriginal land trust, will not be seeking any exemptions for tourists. 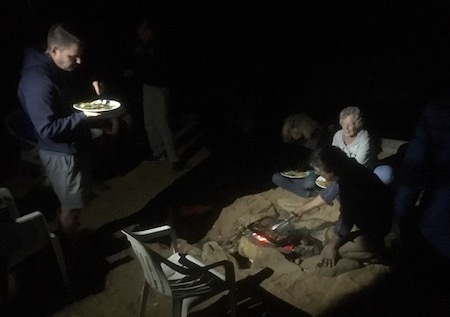 On Saturday night the Alice Springs News Online was present at what is likely to be another milestone: traditional owner Rhonda Inkamala hosted a family from Minnesota, USA, at a campfire barbecue cooked by partner John. Ms Inkamala is not your garden variety tour guide. The Western Aranda and Luritja woman is multilingual and multicultural, fluent and literate in the Western Aranda, Luritja and Pitjantjantjara languages, and has a good working knowledge of other Arandic languages of Central Australia. 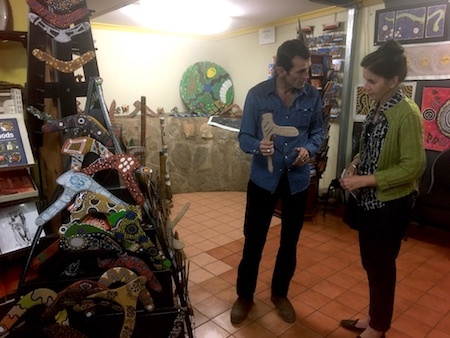 She was previously employed as the cultural principal of Yipirinya School, is a cultural adviser to Parks and Wildlife and the Central Land Council, and is collaborating with anthropologist Dr Anna Kenny on a book about Carl Strehlow’s Western Aranda language work. She organises the regular introductory language classes and painting lessons (you can paint your own souvenir). A personalised cultural tour from her, culminating around the campfire in a small sandy clearing by the creek coming from the chasm, was the highlight of US family’s Australian visit, according to grandmother Janet and three generations of her family. It doesn’t get any better, said Janet, as the family tucked into with their meal of kangaroo and vegetables cooked over the fire, after a day in the bush, digging for witchetty grubs and learning about bush tucker, bush medicine and all the other things Rhonda was able to show and talk to them about. They had been in Australia for three weeks, had done all the tourist things, in Sydney, Cairns, on the Great Barrier Reef. They’d been up in a hot air balloon in Alice, loved that, but this was far and away the best thing they had done. 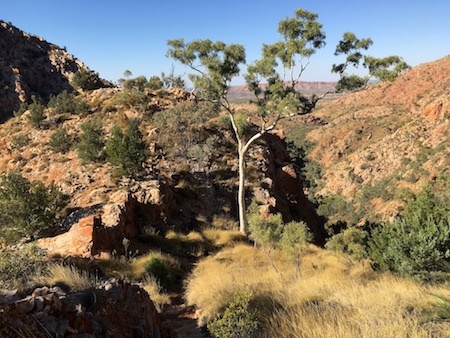 It had come together just that day: Janet wanted a genuine Australian experience that was about more than entertainment, the tourism information office that morning suggested she call Standley Chasm, Ray put her in touch with Rhonda and away they went. It will be the first of many, says Ms Inkamala. Her countrywoman, Deanella Mack, also offers the Angkerle cultural experience to visitors – with in-depth campfire, cultural conversations and workshops. AT RIGHT: Ray Prunty in the souvenir shop. Other Aboriginal kiosk employment is fluctuates between two and four local staff. The majority of seasonal employees are still non-Indigenous, “happy to spend their short working visa time out in the Central Australian bush,” says Ray. A sideline for some in the Iwupataka Land Trust is painting souvenir boomerangs with individual designs, for sale in the gift shop for $25 each. 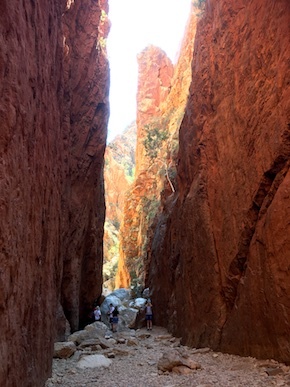 A lot of thought has gone into the walking track to the chasm – a bit more than a kilometre. 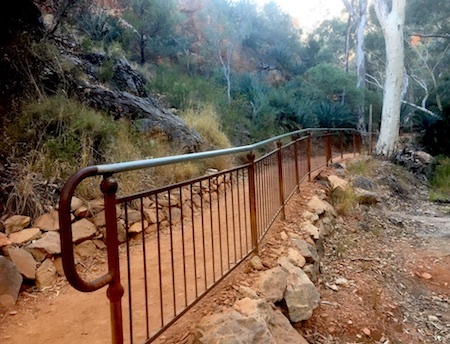 Now suitable for wheelchairs “with assistance”, it has been raised above the creek bed, bolstered by stonework and with a handsome railing in sections: no plastic black bollards here, the rusted steel blending well with its bush setting. The railing was made and installed by the Centre for Appropriate Technology, while the stonework was laid by Snapper John Tracks from Tasmania, with resort staff providing much of the elbow grease. Well, I have been out there a few times. I spoke to Ray about some of many improvements he has made as I thought he had done a fantastic job. Ray introduced me to some of the Aboriginal workers and there were quite a few milling around doing various jobs. Keep up the great work Ray. Most locals (according to one political party) work! Maybe on stations but not in Alice. If transients and other who immigrated here did not provide the customer service this town would die. Evelyne: You look to be trying to make an argument where it was simply an observation and a point of view. People are allowed to have a point of view, you know it creates discussion which is good for society. I think you are very inappropriate in comparing people to animals. The quote you have is simply pointing out the lack of work out there. Wayne, I’m sure they have, it’s just unfortunate that they can’t get or retain local staff for these simple POS positions. James, you are assuming they have not tried to recruit Aboriginal people. Is this correct? James, it is not because you did see that there was not there! Who do you call locals? Do you mean the Aborigines who own the land? They are not zoo animals to be displayed as tourist a attraction. Nice to see the progress. Good work Ray, Caroline and Rhonda! I went there a few months back and was shocked to see not one Aboriginal employee around the place. Their website said owned and operated and I was keen to see how it was working out there and how well they promoted it, but there were only tourist working there. A missed opportunity from my point of view, would be a good chance for tourists to see the locals working and promoting their country. A real shame.